I’m not sure that I’ve ever read an Icelandic novel, and if that’s true then I started with a blast when I picked up The Pets from Bragi Olafsson. It’s a simple enough plot that revolves around the relationship between two men: Emil and Havard. Emil is divorced and the father of a young son. He has a long-distance, vague relationship with Vigdis: “My girlfriend or lover (depending on how you look at it)” . When the book begins, Emil is returning to Reykjavik after a trip to London. He won the lottery and went on a spending spree, returning with cigarettes, whisky and bags full of CDs. Also, rather significantly, he did not get the items Vigdis requested. On the plane back home, he sits next to a middle-aged linguist named Armann Valur who bores him by constantly talking. On the up side of the plane trip, he runs into fellow passenger, Greta. He saw Greta years before at a party and she’s occupied his lustful fantasies since that time. Emil can’t believe his luck when he strikes up a conversation with Greta and she agrees to come to his apartment later that night. Emil returns home looking forward to listening to his cds and drinking some of his duty-free whisky when he’s warned by a neighbour that a strange man wearing an anorak and carrying a plastic bag has been hanging around and asking for Emil. The strange man is Havard, a former co-worker and one-time co-housesitter–a walking disaster of a man Emil has every reason to avoid. Havard, who’s spent the last few years in some sort of institution is, at the very least, bizarre and eccentric, but he’s also possibly a great deal worse than that. With Havard knocking persistently at the door, Emil hides somewhat humiliatingly under the bed, but Havard, who’s anything but predictable, breaks in…. We had only known each other for about a month when we went off to London together. And it was by complete chance that Havard, whom I didn’t really know at all, accompanied me. I had just started working in a hardware store when a friend of my father, a former professional footballer and joint-owner of a soap factory in England, invited me to stay in the flat he owned in London for six weeks and take care of some animals that lived there: a cat, a rabbit, a guinea pig, and an ancient iguana. Go away as far as possible, much further than just out of London, preferably to another country. And he said–with a grin fueled by two or three pints of Special Brew he had drunk before lunch–that if I could give him four hundred more then he would never show his face again. I should have given it to him. Really it’s no small risk one takes, boarding an airplane. For three hours (not to mention on longer trips) one is locked in a tight, uncomfortable space, way above any civilization, with unpredictable people, who could drink themselves senseless or spill their food and drink all over you–and the only place of salvation is the toilet. It took less energy participating in something boring than trying to struggle against it, especially when there was no possibility of avoiding it. This deceptively comic novel says a great deal about avoidance and tolerance of aberrant behaviours. 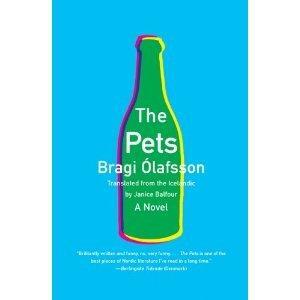 The Pets is great literature for the way in which it forces us to examine our own lives as we recall the Havards we have known, the point at which we realised that these relationships were invasive and destructive and just how much we took before giving our own personal Havards the old-heave-ho. Emil relieves his past in a nasty no-exit-existentialist sort of way through the invasion of his own home (instead of someone else’s), the misuse of his property, and the resolution of his past thoughts about Greta. If time has some special role then I think it is two-fold: to take things away from one…and to give one something else instead…-something that doesn’t replace the loss, but helps one to forget now and again what one has lost. I’ll bet you’d enjoy The Ambassador, also by Olafsson and Open Letter. Similar humor, Icelandic, and a ton of fun. I’ll look for The Pets now myself! I want to read the Ambassador too. If it’s anything like The Pets, it’ll be excellent, and, from what you say, it sounds as though it is. I want to read this. I read and reviewed three Icelandic novels so far and liked them all although they were quite different. I watched some of Kormákur’s movies and found exactly the type of humor you describe. I got the novel 101 Reykjavik after having wathched the movie and it should be quite good. I’ve seen a few Icelandic films and throughly enjoyed them all–including 101 Reykjavik (didn’t know it was based on a book). I came to The Pets with high hopes thanks to the Icelandic films I’ve watched, and I was not disappointed. I think I’d like this one too. I wonder how Emil would have dealt with Maxwell Sim and his desperate need for socializing on that plane. I wasn’t ready for how funny this book was, but once Caroline mentioned Icelandic film, I made the connection. She’s right. It does sound huge fun. My only dip into Icelandic fiction so far has been crime and the sagas. I note this is on kindle. Perfect for my upcoming holiday I think. Have you seen the Sjón reviews? There’s two at Just William’s Luck and one of those is also covered at the Asylum. They look very interesting. Icelandic fiction influenced by history and folklore. I really enjoyed this. Just finished the Ambassador which was funny but not as good (IMO). The Pets is your sort of thing. I hope so. I bought it last night. Iceland does seem to have a fairly vibrant literary culture. Then again, they have the sagas as a sort of ur-inspiration. The sagas I’ve read, though a thousand years old, still read well today. I haven’t read any of the sagas, so this was the first for me. Landing on The Pets was a lucky break I think. The Saga of Burnt Njal and Egil’s Saga are both excellent. I really enjoyed both and they’re surprisingly accessible. Thanks, I’ll keep those titles in mind. My next foray into Icelandic fiction will be either Jar City or 101 Reykjavik. I reviewed Jar City over at mine. I own 101 but haven’t read it yet. I’ll be interested in your thoughts either way.